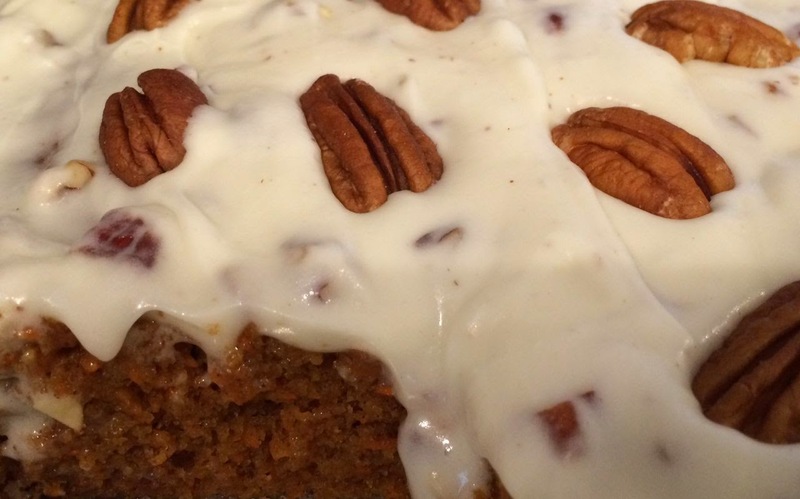 Okay, who doesn't love a good carrot cake! I've reworked this recipe to make it more friendly to those like me who are more health-conscious. Changes include no oil, better flour, egg beaters, and non-traditional sugar substitutes which I think ended up making it even better, but I also included substitutions to make it the traditional way if you prefer. Note: this reworked recipe is so moist that you can eat it without any icing (my preference), but if you have a icing-loving person in your family (I do), you can add in the icing. Picture shows full icing added which is a lot and too much in my opinion. I recommend making half the icing recipe shown below. It's plenty enough and I usually do that but forgot this time. Batter made with my healthier substitutions will not be as thick as most cake batters, but bakes up beautifully. Pour into a 9 x 13 inch baking dish and bake for 35 to 40 minutes (test with wooden toothpick inserted into center of cake -- will come out clean when done.) Edges may appear a little dark. Don't worry, it will not affect the taste. Mix the cream cheese and butter or margarine together until very creamy and light. Slowly add in the powdered sugar. Mix slowly at first to avoid a face full of powdered sugar. Once powdered sugar has been fully incorporated, taste icing. Is it sweet enough for your taste buds? If yes, add in the chopped pecans now. If you prefer it a little sweeter add in a little more powdered sugar and then taste again. I prefer it just slightly sweet so that it does not overpower the cake.